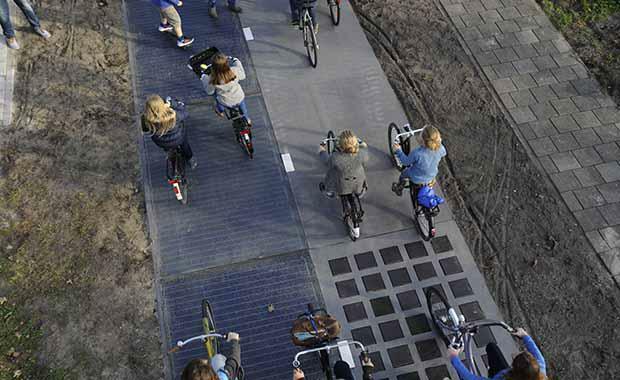 Could Solar Roads Be Our Renewable Energy Saviour? Over the years the planet’s population has grown to more than seven billion people. According to the most recent United Nations estimates, the human population of the world is expected to reach eight billion people in the spring of 2024. This peak in population growth will have a huge effect on natural resources available to us such as coal and oil. Every day we burn the oil equivalent of 50 million barrels worth of coal in Australia alone. The World Coal Association says proven coal reserves will run out by 2130 worldwide. Coal is not a renewable resource hence the urgent need to develop reliable and renewable energy sources now rather than later. Solar powered energy is not anything new. However in order to produce large quantities of solar power without having to use pastures and fallow lands engineers have come up with a viable solution- solar roads. The mechanics behind solar roads will work similarly to rooftop solar panels; sunlight, which falls on the road surface, will be absorbed by solar cells and converted into electricity. The electricity generated will hold practical application in street and traffic lighting as well as generating electric cars as they drive. The idea of creating a closed eco-system through solar roads is a beautiful dream – from mobility through to energy and back to mobility – however is the dream for an efficient renewable energy source strong enough to overpower the many complications and flaws the idea holds. The panels will have a translucent top layer of tempered glass, which will work as a protection shield for the crystalline silicon LED solar cells which lay underneath. The top layer of translucent tempered glass holds both sustainable and practical difficulties – the glass needs to repel dirt to keep a translucent cover for the sunlight to reach the cells underneath, as well as be skid resistant, which needs to be strong enough to hold pedestrians and vehicles using the road. The biggest unknown about the idea is the safety of the panel. Driving and/or walking on tempered glass is completely different from driving and/or walking on asphalt, which is designed specifically to increase friction. The panels also hold the issue of the glass cracking and/or liquefying overtime and becoming a hazards to pedestrians and vehicles. Experiments have been completed to test the stopping time of a vehicle travelling 80 miles per hour (128 kilometres), however the experiments were done in a controlled environment with minimum variables. Size and weight of vehicle, as well as weather conditions and heat were controlled variables in the experiment which need to go under further investigation before the idea can be green lit by authorities. Durability of the panels is yet to go under construction. It is currently unknown whether the panels will stay in tack and functioning over a long period of time. It is also unknown whether the product is cost effective in the long term, and if the cost of services are outweighed by the amount of money saved from the energy produced. The availability and accessibility of material and equipment holds a major effect on the solar roads. If the product is not easily available to use, it is unlikely for the final product to have a significant effect on their pursuing their dream. SolaRoads, found it extremely difficult to find a supplier to produce large circuits, to put under the tempered glass. After much difficulty trying to find a supplier to create the ideal circuit needed for the solar roads, the entrepreneurs decide to purchase the products separately and assemble the circuits on site. There is one more technical detail which hasn’t been verified yet – the effectiveness and performance of the solar cells themselves. Due to the path not being able to be adjusted to the position of the sun, the panels will generate approximately 30 per cent less energy than those places on roofs. However, it is still unknown whether the performance of the solar panels will stay consistent in the long term. After many years of testing, solar roads long term vision is still far in development. It is unknown whether the panels will be developed to a standard for high impact environments, however could potentially be used for pedestrian walkways and sideways in the near future.